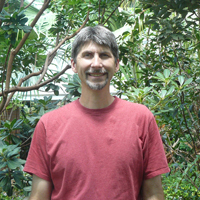 Mike Palmer has been with Matthaei Botanical Gardens since 1990, joining the staff after he received his B.S. in Commercial Horticulture from Purdue University. At Purdue he focused his studies on woody plants and plant propagation, with emphasis on botanical nomenclature and public gardens. He was also a lab instructor for a class taught by Dr. Harrison Flint, author of Landscape Plants of Eastern North America. The class focused on woody landscape plants and their identification. At MBGNA, Mike coordinates research in the greenhouses and is gatekeeper for research projects on the grounds. Mike also supervises greenhouse production for university classes, and use of the collections by constituants.